It’s easy to see why used Nissan cars sell as fast as they do in Gloucester thanks to a huge range of practical and affordable motors, ranging from the curvy Juke SUV to the heavily revised GT-R thoroughbred racing car. Nissan is a brand renowned across the country for outstanding build quality and a surprising level of standard motoring tech, which is featured in virtually every vehicle in the line-up. Mountbatten Car Sales, based in Gloucester, is the area’s number one supplier of pre-owned cars from a selection of the world’s most infamous brands, including Nissan. Our site is based in Gloucester, where you can explore our entire range of used Nissan cars for sale, including popular options such as the handsome Qashqai SUV and the stunning 350 Z convertible. 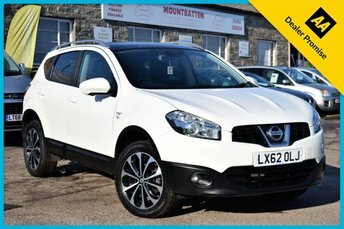 At Mountbatten Car Sales, we strive to ensure all our customers feel confident that they have received the best deal on their next vehicle, which is why we thoroughly prepare our used Nissan cars to the highest standard prior to their sale.